After four days of great racing in the Myall Lakes, a fantastic national park on the NSW central coast. From Jan 20-23, 2019 Check out the notice of race and book in! Be great to see you there! All booked in, myself and 3 of my kids are coming to race. Only four sleeps to go! until we see each other again and have some great sailing together. 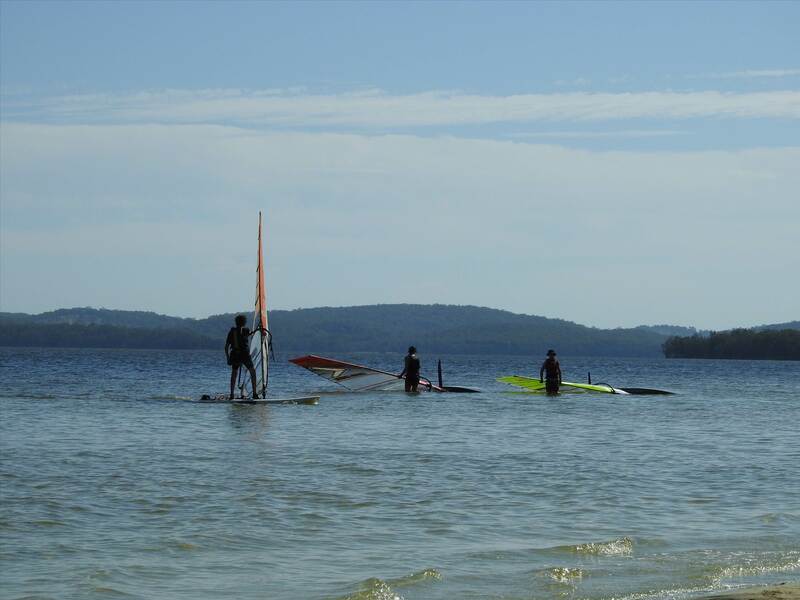 2019 Raceboard and Formula Nationals at Myall Lakes (Sunday 20 Jan - Wednesday 23 Jan). Here are some helpful tips for those not familiar with the area. Thanks Murray! Getting there Option 1 - Exit Highway at Bulahdelah and head along Bombah Point Rd (5km of this road is gravel road). Quickest and cheapest route. Option 2 - From Hawkes Nest via Mungo Brush Rd, need to use ferry ($6.50 for car + $6.50 for trailer). Operates 8am to 6pm daily. Food and Drink Myall Shores caf? has a selection of meals available to order for lunch and dinner plus sells milk, drinks, and ice creams. Note it may close soon after we finish racing for the day. (The park advises the on-site Barefoot Caf? is open 7 days a week from 10am to 7pm for coffee, cakes, snacks and all day pizza. I understand they also have ice for $5 a bag. )Come prepared with all essential supplies to last the duration of your stay and the tip is to rely on the BBQ facilities.Alternative is a trip to civilisation in Bulahdelah or Hawks Nest approx 15 - 20 minutes each way. If you like tank water you're in luck, alternative bring sufficient fresh drinking water. You're in the bush Suggest insect repellent for after dark. Getting around the Park The park is spread out so a bike is handy to zip around on. Registration opens Saturday 19th January from 2pm to 5pm, and is available briefly on Sunday morning from 8am to 9am.Competitor Briefing is 9am Sunday 20th January, with first possible start 11am. Class meetings have been scheduled for Monday night at 5.30pm. Please note the amendments to the NOR. www.ausraceboard.org/2019-raceboard-and-formula-nationals/ These reflect the changes to the Formula age categories determined at their latest AGM. Also please note the 7.8 Raceboard category has been changed to an 8.5 category to reflect the expected numbers of competitors in this class. And if you have not entered yet, do so by COB Thursday. That's tomorrow. Get onto it! Hi, is there an 'open' classification at the Raceboard Nationals where anything goes? I'm testing a foil on a 30 year old Speed 250L race board and would like to test its speed against other old race boards using normal fin. I don't race at all, am not a member of an affiliated club and probably don't meet other entry requirements etc. But as it's a National Park with public ownership, I can see no valid reason why I couldn't just turn up, keep my distance and test if other older race boards (if any) get further away or closer with me following a safe distance behind them. These are my thoughts, you can get a raceboard doing 10 or so knots upwind at a decent angle and that's about as good as they get, if you get yours foiling I suspect it will be going quicker than 10 knts on that point of sail. However can you foil it around a course in a fleet because a race is more than one point of sail and can you get it foiling in everything from 3 to 30 knots because a regatta is more than one race. If your gonna come why don't you enter the regatta and rather than test your foil, use a normal fin and test yourself. You could always compare your foil against others outside the official racing I'm sure there will be interest in it. Yes, it's called the Windfoil Nationals. Thanks Cammd, good points... but the foil on RB is just a summer project I'm working on. Competing in a whole regatta on fin isn't part of the plan. Almost no one in Canberra uses a RB any more. Former RB racers are foiling now. So no local test opportunity. IMHO I don't think a National Championships is the best place to test your summer project, lots of people are spending their holiday time and money to be at and compete in this event, both Formula and Raceboarders. Following in behind the fleet's will only result in you being in the way when everyone comes back downwind. The race course will be quite busy already with two fleets racing. Agree stay off the course & keep out of the way. I've looked at the map and I can explore the western half of the lake and leave the eastern half well alone. Besides, I'm told racing now is mainly up-wind & down-wind which is not the old board's strength - which is beam & broad reaching across the wind. Probably more aligned to recreational blasting. So thanks for the good advice and I'll be sure to stay well away & off the course. 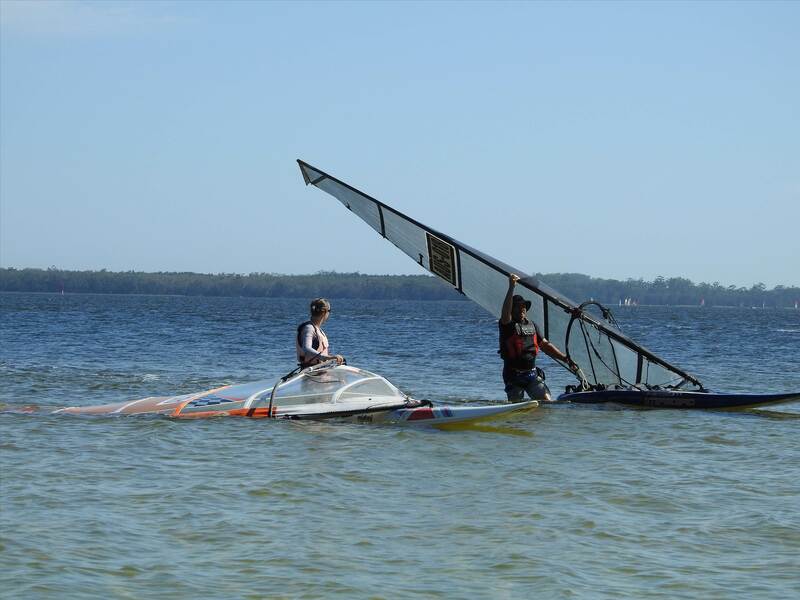 I love the idea of your summer project, and I'm curious how you'll get a Raceboard flying and what the setup is that you have. The Speed boards were ultra competitive back in the day and there's hardly any about these days. I think you'd find it would still be competitive in most conditions, even upwind/downwind. As Cam suggested, why don't you register and compete in the Regatta you'd be most welcome! Would be a great experience for you since you have no other Raceboards in Canberra. You can join Stormriders club online for approx $60 which includes $20 million public liability insurance virtually any time you sail anywhere in the world which is mandatory for any regattas in Australia. I'd be more than happy to do some testing with you before or after racing. If you need entry details please ask. 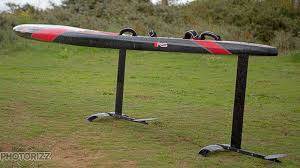 It's just an old race board with a foil that replaces the centreboard and acts as a 'winged keel' to give extra lift. I've had it up on brief flights, but the aim is not flying like a dedicated foil board. 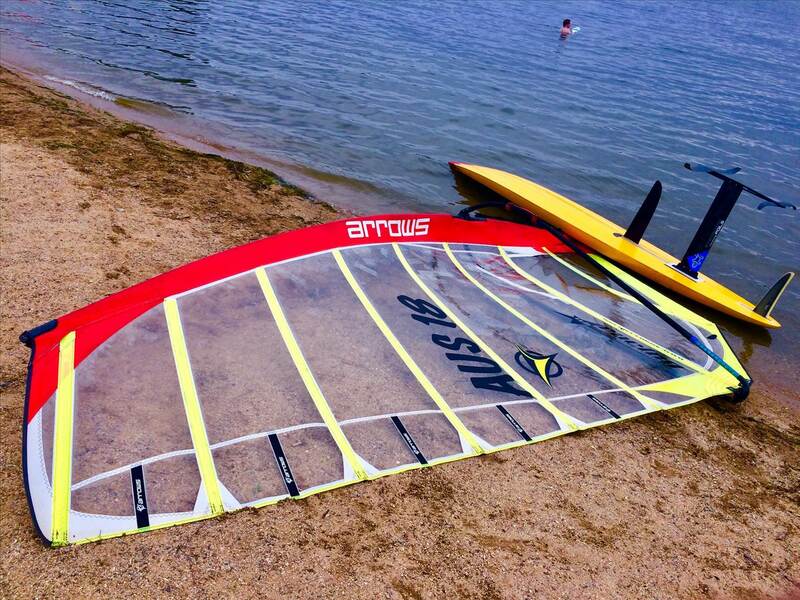 A formula board flying on foil will easily kill my RB+Foil for speed and on all points of sailing. It's possible the foil just slows it down compared to on fin - due to extra weight & drag of the foil. But there might be a certain range of conditions where the RB+Foil could be faster than RB+fin. That's where I hoped an 'Open classification' where anything goes on a RB at the regatta was going to help me find out. But I won't risk upsetting, irritating or annoying regatta entrants - who think I'll be in the way - so have made other plans for early next week. I took your advice and joined StormRiders Club - and will consider entering future NSW RB / formula regattas. Thanks for the information you provided! Very helpful. 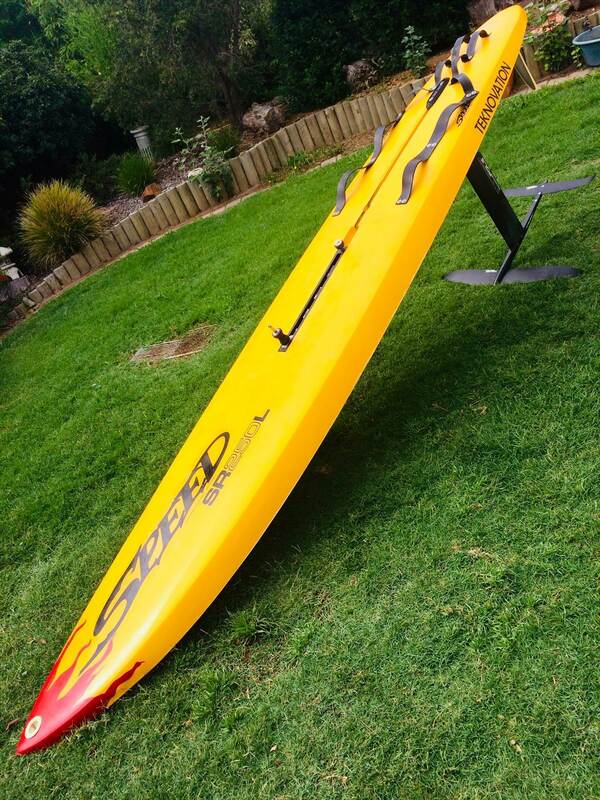 See you at one of our NSW Raceboard events Looking forward to seeing your Raceboard foil setup. Any chance you could post a few photos? Great work Julien! Stylin pic. Never seen an RB used like that before. Cool photos Cam, I'm sure the kids would have enjoyed the racing! 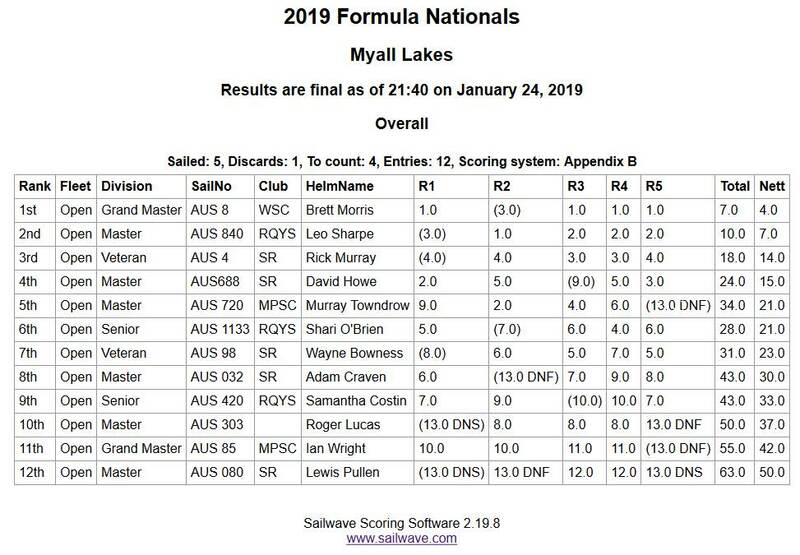 A big jump in youth and female sailor numbers has been a feature of the 2019 Raceboard Nationals at Myall Lakes in NSW. The event (20-23 of January) was held with the Formula Nationals, and attracted a combined fleet of 47 boards, including 35 Raceboards - up from the previous year in Brisbane where 29 boards competed. The Raceboard Overall trophy was lifted by Brisbane-based Julien Savina, who has competed in Mistral and RSX World Championships for his native France, and trialled for French Olympic selection for Athens. 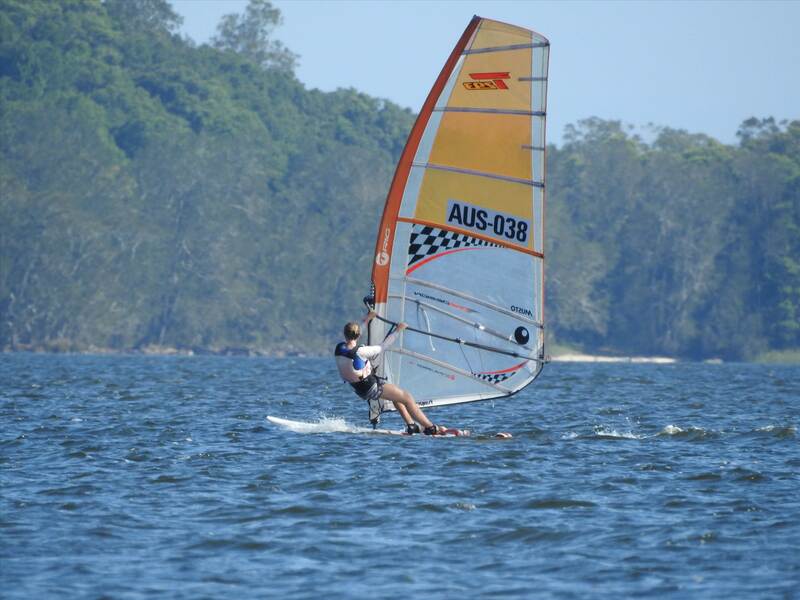 Julien finished best-placed Australian in the recent Windfoil Oceanics. But he didn't have it all his own way, with strong performances from defending champion Cam Harrison, and rising star Grae Morris, who notched up 4 wins and sailed well beyond his 15 years. Grae took out the NSW Raceboard Titles this season, and came second in the Australian Youth Championships in Hobart on the Bic Techno Plus. Keeping it in the family, Grae's dad Brett Morris took out the Formula event, from Leo Sharp and Rick Murray. Grae was one of the 11 sailors under 21 years of age competing in the Raceboards, a big increase on youth numbers of previous years. And in another advance, six women competed in Raceboards, with another two battling it out in the Formula. Across the two fleets, there were also seven sailors over 60, proving the growing appeal of the sport across the demographics. There was some close racing in the 8.5m fleet, but youth sailor Vaughn O'Shea dominated the pointy end, winning all but two races. Max Irvine (Youth, RQYS) was second, with Tony Matta (Grand Master, Lake Cootharaba) third. Hailey Lea (Lake Cootharaba), who was third youth overall, came in fourth, and was the first female in 8.5m. Thanks go to our PRO, John O'Brien, who volunteered his time to travel from Brisbane to manage the racing. He worked seamlessly with mark boat skipper Craig Ferris, and was assisted by volunteers Karen Murden, Conor Coleman, Brad Younger and Sue Plodr. Great photos from David "Belly" Bell. Posting updates was tricky given the lack of connectivity, but the location was very picturesque and it was a great venue for social events, with virtually everyone on site together. Next year the Nationals will be in Brisbane, at RQYS. Dates will be confirmed shortly. Sounds fantastic congrats to competitors and officials! Hope to see you at RQ. Next year ( I'll be the one at the back of the fleet!!). Thanks for the pics and videos. That board looks on great condition. It'd be great to see how competitive it is these days as a standard Raceboard and also how it feels with the foil. 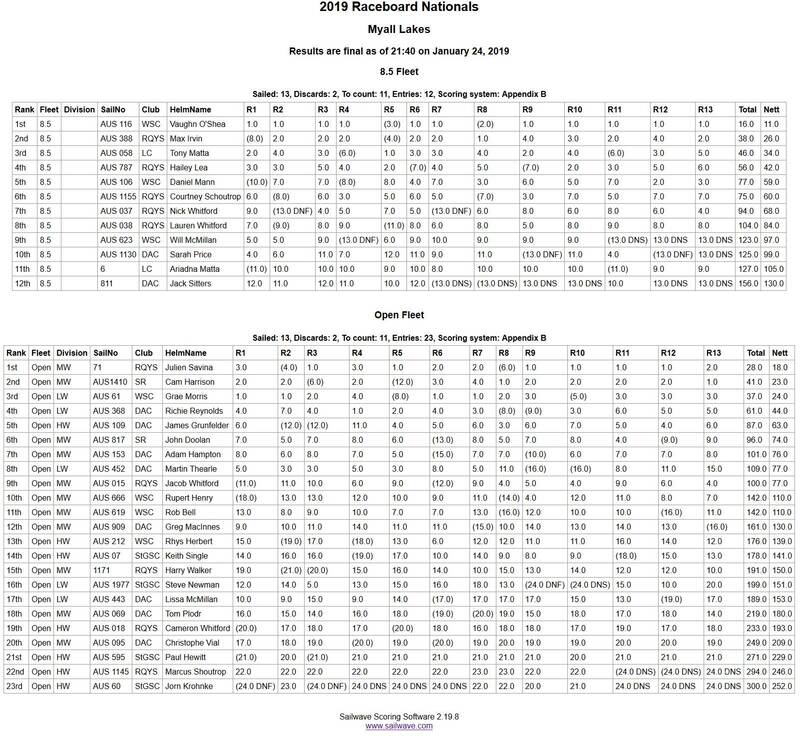 Great summary of the Nationals... and congrats to all competitors and place getters. I'll cherry pick a few NSW regattas closer to home and test my Speed against the ubiquitous Phantoms and other RBs. The Phantoms have the advantage due to lighter weight & 10% higher volume; massive centreboard & tail fin; earlier planing from wider tail, bat wings, softer rails... & other technologies built in. In a way, the foil might partly compensate for all that. But the narrow tail of the Speed could be an advantage in 20+ knots on normal fin... where it shines. Nice write up. Good to see the sport so well supported. 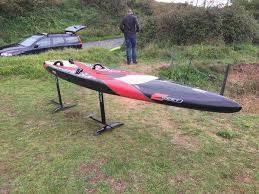 Once again I find myself looking to buy a used Starboard Phantom to be competitive if I enter a regatta. But then the cost hits me in the face and I think I could just use my old Speed 250L RB... with a foil on it. Why? The Phantom has bat wings that make it wider and give it more lift and get it planing earlier. My view is that the foil does the same thing as the Phantom's bat wings, but is also much heavier and creates more drag to slow me down. Given the similarities between foil and bat wings, I believe I should be able to enter Raceboard events like the NSW series and the RB Nationals using my 30 year old Speed 250L... with a foil. 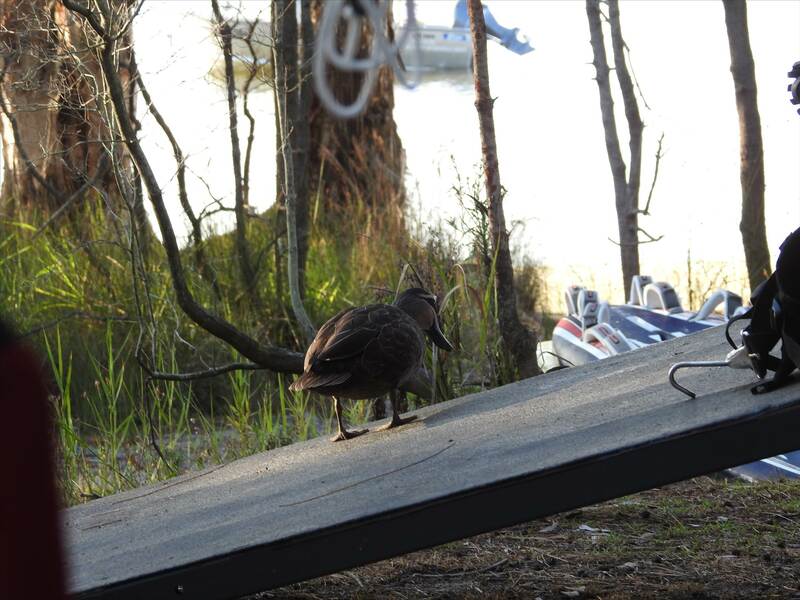 It's not a foil board and doesn't get up and fly like one - at least not yet. And even if the rules stipulate what a Raceboard is, I'd like to think I would be welcome to participate in such regattas - even if I'm technically disqualified from the races because of the foil. Like I said before, if regattas are held on public waterways, there's no valid reason I can't be on the water alongside racing vessels. And as for getting in the way, I can steer my board pretty well after 30 years experience on it and keep out of everyone's way... and anyone competing in a regatta who can't do the same for me... well, they shouldn't be competing as they're a danger to others on the water! So, I look forward to sailing alongside other raceboards at a future regatta - with my old board + foil even if I don't qualify to race - and anyone who has issues with that can please stay out of MY way and my face! Why not race the speed as a RB ??? When I compete, I like to feel I have a chance to win. But my old Speed RB on fin is just not competitive with a Phantom - so there is no chance to win... ergo no point me entering RB on fin as the entry fee just becomes a donation. And to be competitive I need to buy a Phantom AND a 9.5m RB sail it seems. The Phantoms + 9.5m are everywhere and dominate the RB arena & I have no chance of placing. They have wings; I have foil. Small difference, but if bat wings are permitted, then why not foil wings? If I'm gonna come last, I'll come last on my terms - which is with old board & foil. Not old board with fin. And who knows, maybe I will be more competitive against the Phantoms. It would be great to see if the old Speed enhanced by foil can turn into a Phantom Slayer. That's what I'd like to test. Are they up for the challenge? Given the similarities between foil and bat wings, I believe I should be able to enter Raceboard events like the NSW series and the RB Nationals using my 30 year old Speed 250L... with a foil. (b) The distance between any point of a fin to its closest point to the hull shall not exceed 700mm. (d) Any other hull appendage other than the fin and the centerboard is prohibited. BTW...older raceboards can still win races against the SB Phantoms when sailed well. Now you're baiting raceboarders... Raceboards have a box rule on length, width, sail size and a minimum weight. 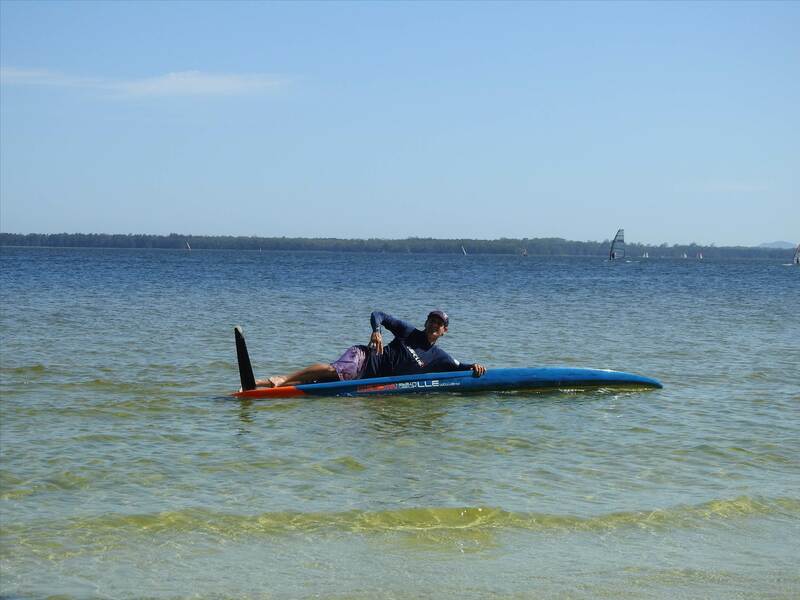 The RB foils (centreboard & rear fin) specify a maximum length. Anything goes within the box rule. F2 Race 380s have won recent world championships. The "batwing" is only Starboard marketing for a wider tail. Unlike Formula Windsurfers, RB don't have minimum race wind strengths. So RBs designs are a compromise and must perform in all wind strength. Of the 13 races at the Nationals, only 4 were sailed in winds above 8 knots. A foiling board wouldn't have made the time limit in 9 races. I agree with AUS814 & da vecta above. The Speed 250, if its not too heavy or structurally challenged, looks like a great RB or join the foiling championship if you want to foil. The current Raceboard Champ was beating all the Phantoms when using an old Fanatic Megacat with gasket issues in a local regatta last year, enter your Speed as a raceboard, if you finish in the top five than blame not winning on your gear but if you come last it will take more than a new Phantom to get to first. BTW I think saying the entry fee is a donation if you can't win is out of line, these events cost money to put on and the organisers do everything on a volunteer basis for the benefit of the sport, there's no profit being made by anyone. Also the majority of the competitors know they won't win but they participate just for the fun and the challenge and anyway the battles for places doesn't only take place at the front, everyone is racing the person in front or behind. I'm not sure why you want to race with a foil in non foiling class... It sounds like if a foiling Moth was asking to enter a Finn regatta for me.